The Burgess Family receiving The Environmental Stewardship Award at the Saskatchewan Stock Growers Annual Banquet. Left to right: Ross McDonald, Lane Burgess, Britt Burgess, Doug Gillespie, Myers, Norris & Penny Representative, Michael Burgess, Tamela Burgess, Edward Burgess, Kendra-Shane Wick. The very name “Big Muddy Badlands” sounds like something out of cowboy poetry. It brings to mind the lore of the Old West – riding the range, cowboys and campfires, roundups, rustlers and outlaws. The badlands have seen their share of outlaws. It was the northern end of the “outlaw trail,” where bad guys on the lam would sneak across the border to escape the reach of US Marshalls. The trail stretched from Saskatchewan to Mexico, with plenty of places to hide. Dutch Henry, Sam Kelley, and the infamous Sundance Kid were among the fugitives to make their way north into Big Muddy country. The badlands, 60 kilometres long, 3 kilometres wide and up to 160 metres deep, were carved by Big Muddy Creek, once a glacial torrent but now a patient little river (most of the time) and one of only three Canadian waterways that drain into the Gulf of Mexico. The creek flows 307 kilometres from Willow Bunch Lake through the badlands and into Montana, where it meets the Missouri River. For anyone who knows nothing about ranching except what they’ve seen in the Hollywood horse operas, the range would fit their preconceptions almost perfectly. And like the legendary cowboys and outlaws, the land looks tough. But like any ecosystem, and maybe more than most, the native grass prairie of the Big Muddy Badlands is extremely fragile. Without care, a ranching operation could easily destroy the valley’s capacity to sustain itself. Michael and Tammy Burgess own Circle Y Ranch near Big Beaver, and are the winners of The Environmental Stewardship Award (TESA) in Saskatchewan for 2014. Michael and Tammy fully appreciate the importance of looking after the land. Michael, 59, is the third generation of his family to operate the ranch, and his father and grandfather before him realized that without proper stewardship the ranch would have no future. R.F Burgess came to Big Muddy 75 years ago, and he immediately understood that grazing in the semi-arid prairie would run in cycles, with wet years offset by droughts. To do that, R.F Burgess, his son Edward, and now Michael have worked with the land, rather than against it. Through the years they have utilized ranching practices like stockpiled forage, dormant-season grazing, rest-rotational grazing, and remote stock watering to preserve and maintain their 20,000 acres of mostly native-grass prairie. Above all, Michael says, the sustainable approach is good for business. “If you look after the land and the grass, it’ll look after you,” he said. For the Burgess ranch that means trying to graze large blocks of the ranch evenly. The Burgesses take pride in preserving the ranch’s native grass prairie. While the cattle seem to prefer the lowlands in the valley, the difficult job of fencing the rugged badlands helps to keep the animals on higher ground. In fact, the drought-prone badlands can harden like cement. That’s why the Burgesses take care to limit the number of cattle they keep, limit traffic on the ranch and stick to established trails as much as possible. Damage to the land will last a long time: Michael says there is an overgrown trail that famous Lakota Chief Sitting Bull travelled when he came out of exile to surrender to American authorities in 1881. “If you go crossways, you bump the old wagon ruts,” he said. The Burgesses also promote grass growth by placing mineral tubs and salt in the brush. When the cattle trample the brush to get to the mineral, more native grass grows in its place. There is a block of range reserved for winter grazing, used only in the dormant season after weaning. The rugged terrain and wooded coulees provide adequate shelter for the cattle, and their grazing is supplemented with hay. The cows will stay out in the badlands as late as May after they have calved out. Water is a challenge. There are some springs on the ranch, and dugouts help to keep a reliable water supply. One of the most dependable dugouts was built by Michael’s father Edward in the 1960s. (Edward, now 91, still helps out on the ranch.) Movable solar-powered pumps feed watering troughs and keep the cattle out of the dugouts. “I love to see the grass waving. We enjoy the wildlife, we’re always excited when we see a baby fawn or a bull moose. This is good habitat for mule deer.” Hunting on foot is permitted on the ranch. “Hunters seem to appreciate this,” Michael said. “It gives them a chance to find the big one without being bothered by truck-hunters spoiling their stalk.” It also reduces damage from vehicle tracks and reduces the fire risk. The ranch is home to several bird species, some of which are on the endangered list. “We have burrowing owls, loggerhead shrikes, piping plovers. We’re happy to do our part for the endangered species,” Michael said. In fact, he believes strongly that it’s thanks to ranchers that some of these species are still around at all. He has taken his passion for stewardship beyond the ranch gate, having served on the SSGA Land Use Committee and the Saskatchewan Wildlife Advisory Committee. He has served as Chair of the Saskatchewan Prairie Conservation Action Plan, and continues to play a key role with the Rancher’s Stewardship Alliance Inc (R-SAI). The Circle Y operation is guided by the concept articulated by R.F Burgess right from the beginning: “if you have old grass, you’ll have new grass.” This is true both literally and figuratively, as the ranch is poised to continue into a fourth Burgess generation. “Our son and daughter are both here, and they’re learning,” Michael said. The ranch is also home to the Old Porch Gallery where Tammy, an artist, displays her work and regales visitors with tales from the region’s colourful history. Beef producers will always be at the mercy of external forces: weather, the feed supply, and rising and falling markets. The fragile badlands ecosystem requires special care, and oil and gas development is knocking at the door along with all the complications that go with it. Still, the Burgesses are optimistic about the ranch’s future. “As long as we have ranching-friendly governments and ranchers’ conservation organizations, we can position ourselves for sustainability,” he said. 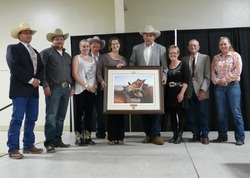 He applauds efforts like the provincial and national TESA programs for recognizing the steps ranchers take, on their own initiative, in the interest of environmental stewardship. Click Here for article: Conserving Sage Grouse Across International Boundaries.